Wildlife artist Laurie Wolf captured an unusual image this week. 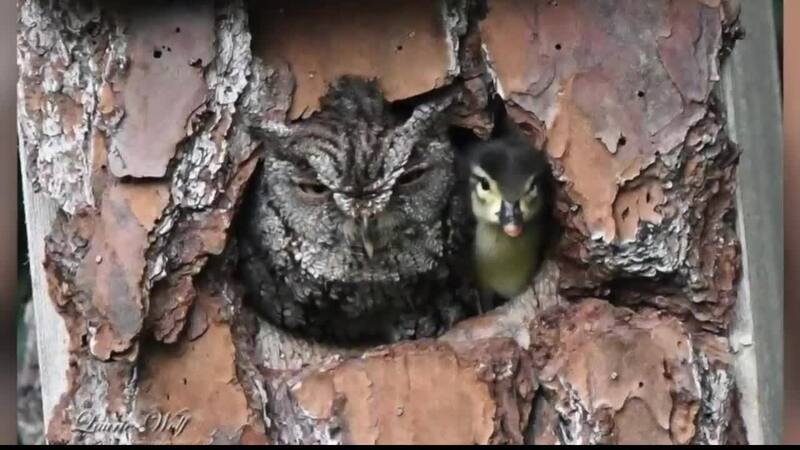 An owl and a duckling side-by-side peering out from a hole in a what appears to be a tree, but she describes as a bird box. JUPITER FARMS, Fla. -- — Wildlife artist Laurie Wolf captured an unusual image this week. An owl and a duckling side-by-side peering out from a hole in a what appears to be a tree, but she describes as a bird box. She wrote that they saw a female Wood Duck three or four weeks ago remove an egg from a box that had been raided by something, and fly off toward this box with it. "We lost it in the trees and didn't want to disturb it. But we believe she put it in the box and the owl hatched it." She added an update later that said, "A bit later, the baby duck was in the hole by itself, calling for the parents. We believe they heard each other because it suddenly left the box and made a beeline for the back fence and our neighbor's pond where the woodies have been hanging out." Cheers to this mamma owl and to what sounds like a happy ending. To see more of Wolf's artwork, visit her website at Wild Works Gallery. WPTV reporter Miranda Christian is interviewing Wolf this afternoon and will have more at 5.